With three levels of pure luxury, you will find it hard to leave this spacious, yet cozy Wears Valley cabin rental. Chestnut Ridge is located just outside Great Smoky Mountains National Park and provides the ultimate setting for relaxation. With no WiFi, you will be able to truly escape and leave all your worries behind you. Picture yourself soaking in the hot tub and taking in the vast views of the majestic mountains that surround you. 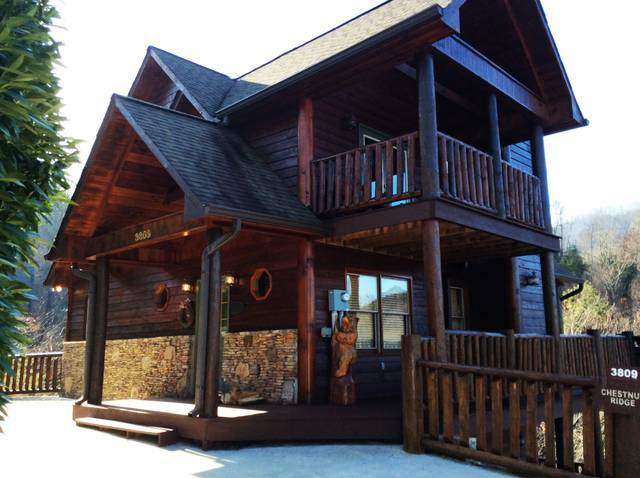 This is one of our most beautiful cabins in the Smoky Mountains! It overlooks the enchanting Wears Valley area, and will have you planning annual trips here for years to come. Each of the three levels offers a bedroom and bathroom and all the luxuries one could want while away from home. The two upper levels offer a plush king bed with the most upscale and comfortable linens in each room and the lowest level has a comfortable queen bed with linens of the same quality. Each bedroom conveniently offers its own TV and its private bathroom. Chestnut Ridge is the ideal getaway for families or friends looking to spend some unplugged time away together. The main level has a cozy living area with wood burning fireplace, and the equipped kitchen and dining area offer a home-like feel. You will find that your time is that much more enjoyable when fully present due to the lack of WiFi and screen time. The upstairs has great views of Wears Valley from its very own deck sitting area, while the downstairs offers an exciting game room with yet another level of deck access. Views can be taken in from each level or bedroom or from the inviting hot tub on the deck. You will be in awe of the beautiful mountain sunset over the valley below each evening! Wears Valley offers easy access to Great Smoky Mountains National Park, Sevierville, Pigeon Forge, and Gatlinburg. These areas are filled with thrilling adventures, beautiful sights, exciting attractions, unique shopping and delicious Southern food! You will quickly find out for yourself what makes these mountain towns so desirable to the locals and tourists alike. Come experience the Wears Valley area with a stay in an exclusive cabin in the Smoky Mountains like Chestnut Ridge! Visit our website for more information about our Wears Valley cabin rentals and our current specials.